40 United Nations ambassadors visit Israel's northern border, inspect Hezbollah's cross-border terror tunnels. 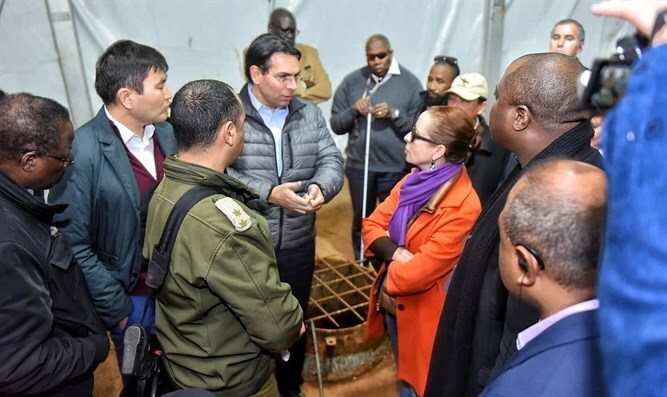 Forty ambassadors to the United Nations landed in Israel last Thursday for a tour of the country hosted by Israel’s ambassador to the UN, Danny Danon. Danon had previously led the delegation on a visit to Poland. The ambassadors visited Warsaw and the Majdanek extermination camp, where they held a memorial service for the six million Jews murdered in the Holocaust. On Sunday, the delegation met with Israeli Premier Binyamin Netanyahu and President Reuven Rivlin in Jerusalem, before heading up north to visit the border with Lebanon. From last December through January, IDF forces operated along the border to locate and demolish cross-border terror tunnels in an operation dubbed “Northern Shield”. While inspecting the entrance to one of the recently discovered tunnels, the ambassadors received a briefing from IDF officers about Operation Northern Shield and Hezbollah's intentions to use these terror tunnels against Israel.